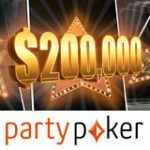 The PartyPoker Five Star Poker Challenge takes place this December and players can qualify for the daily $5,000 Party Poker freeroll tournament by earning just 5 PartyPoints. 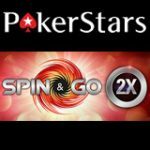 There is a Five Star Poker Challenge Finale where qualifying players can play for a $50,000 prize pool plus a Five Star Poker Challenge Jackpot where players can win up to $500,000 for winning the daily poker freeroll tournaments. 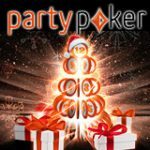 This December players can win their share of a $5,000 prize pool every day in December int the PartyPoker Five Star Poker Challenge. 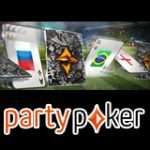 To qualify for free entry players must earn just 5 PartyPoints to get their seat to the daily poker freeroll tournaments. Players can participate in as many freerolls as they like to win daily cash prizes that is a total of $155,000 in prize pools this December. 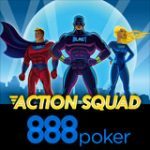 Players who earn 5 PartyPoints are eligible to play the freeroll on the follow day. 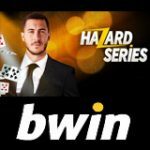 Any player who qualifies for five daily freerolls will get a seat to the Five Star Poker Challenge Freeroll finale in January 2011 which has a $50,000 prize pool. Earn 5 PartyPoints in 5 days in December to qualify for your seat. Players who win more than one of the daily poker freeroll tournaments will get special jackpot prizes up to $500,000. 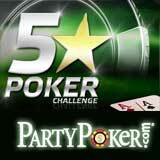 Put your poker skills to the test in the PartyPoker Five Star Poker Challenge. To qualify for jackpot prizes players must finish in first place in any of the daily Five Star Poker Challenge freerolls. There is only one of each jackpot prize available and will be awarded to the first person to claim it by contacting the PartyPoker support team via email.